Lest history is revised as a means for present deceptions and determinations and before another angry atheist/liberal professor/fiction writer decides revisionist history is the best way to fool “We the People”, let us read the following proclamation by President Abraham Lincoln. A note of context: Eyewitness accounts of the Surrender at Appomattox tell us the events of the Lee-Grant surrender meeting took place at the McLean house on April 9, 1865. Abraham Lincoln’s proclamation, announced about a year and a half before that day, was made to declare a national and unifying day of Thanksgiving. (Each state had celebrated Thanksgiving on a different day.). The year that is drawing towards its close, has been filled with the blessings of fruitful fields and healthful skies. To these bounties, which are so constantly enjoyed that we are prone to forget the source from which they come, others have been added, which are of so extraordinary a nature, that they cannot fail to penetrate and soften even the heart which is habitually insensible to the ever watchful providence of Almighty God. In the midst of a civil war of unequaled magnitude and severity, which has sometimes seemed to foreign States to invite and to provoke their aggression, peace has been preserved with all nations, order has been maintained, the laws have been respected and obeyed, and harmony has prevailed everywhere except in the theatre of military conflict; while that theatre has been greatly contracted by the advancing armies and navies of the Union. Needful diversions of wealth and of strength from the fields of peaceful industry to the national defence (sic), have not arrested the plough, the shuttle or the ship; the axe has enlarged the borders of our settlements, and the mines, as well of iron and coal as of the precious metals, have yielded even more abundantly than heretofore. Population has steadily increased, notwithstanding the waste that has been made in the camp, the siege and the battle-field; and the country, rejoicing in the consiousness (sic) of augmented strength and vigor, is permitted to expect continuance of years with large increase of freedom. No human counsel hath devised nor hath any mortal hand worked out these great things. They are the gracious gifts of the Most High God, who, while dealing with us in anger for our sins, hath nevertheless remembered mercy. It has seemed to me fit and proper that they should be solemnly, reverently and gratefully acknowledged as with one heart and one voice by the whole American People. I do therefore invite my fellow citizens in every part of the United States, and also those who are at sea and those who are sojourning in foreign lands, to set apart and observe the last Thursday of November next, as a day of Thanksgiving and Praise to our beneficent Father who dwelleth in the Heavens. And I recommend to them that while offering up the ascriptions justly due to Him for such singular deliverances and blessings, they do also, with humble penitence for our national perverseness and disobedience, commend to His tender care all those who have become widows, orphans, mourners or sufferers in the lamentable civil strife in which we are unavoidably engaged, and fervently implore the interposition of the Almighty Hand to heal the wounds of the nation and to restore it as soon as may be consistent with the Divine purposes to the full enjoyment of peace, harmony, tranquility (sic) and Union. 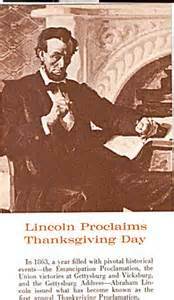 President Lincoln, a Deist, never forgot that a higher and providential power, a sovereign theistic objective morality existed enthroned above – “Almighty God.” Lincoln acknowledged the right of God to deal with mankind on His terms. Counselors, psychologists, social workers ad infinitum-the whole earthly host of remedial pacifying gurus-have diagnosed and they have declared of mankind “I’m OK, You’re OK.” Guilt, shame and a conscience are not worthy of YOU. Instead, coming out PRIDE is what you are meant for. Ergo, anyone outside the perimeter of YOUR being must be denied as existing or, at the most, nondeserving of any attention, except as it emulates YOU (e.g., the homocentricity of homosexuality). Social justice must be a reflection of YOU – love yourself (and Mother Earth) as your neighbor should be coerced to ‘love’ you. Facebook and Tweet your goodness (and grandiosity) for the entire world to see. Thanksgiving, counting your blessings and God Himself, whether as Lincoln’s distant Deist or as the Infinite/Personal God I know are now considered ‘things’ of the past. As we approach Thanksgiving Day – my favorite national holiday along with the Fourth of July – I am constantly reminded of the extreme blessings that have been poured into my life. Both hands cannot begin to hold the cornucopia of goodness from my Lord in the land of the living. Daily I am confronted by the unrest and discontent of almost everyone I meet. These people are union workers, my non-union coworkers (yes, they have a well-paying job with benefits and they complain anyway) and the abundantly blessed who are betwixt the commercialism they so publicly lambaste and so privately desire (e.g., the Occupy Wall St. tribe; see video below). Our current leaders are unworthy focal points for any national horizon where thanksgiving may arise. Unlike Abraham Lincoln our leaders induce and enable ingratitude. Their own compromised and disfigured lives coupled with their “everything is political” reductionism generate universal discontent-a “bah-humbug” unrest with the current state of things. As logocentrists in their own minds, they provoke ingratitude in order to present themselves as “pursuit of happiness” purveyors, saviors of the rights of being self-supreme but always, always, as advertised recipients of their largesse as they administer the providence of almighty government. One last comment: Do atheists give thanks? Who do they thank? And why? For them, aren’t Thanksgiving Day and Black Friday a break from work to enjoy crass materialism, endless football and feasting? A day of hedonism? A Thus Spoke Zarathustra Day? Is life now to be understood as one big riverboat casino with you as the captain of your own fate, the Proud Mary rollin’ down the river? For the atheist isn’t everything that happens and everything handed to them, whether as relative good or bad, just collectivized random events, Logical Atoms, knowledge based on sensory experience, existential relativity derivative of Darwinian evolutionary materialism? And, Thanksgiving Day, isn’t it just a form of epicurean escapism from the drudgery of a riverboat life? Perhaps atheists thank government for socialized medicine, another outcropping of materialistic atheism. Thanksgiving requires a leap of humility and that is a crevice too wide and distant from one’s self, one’s will to jump over. Life for me without giving thanks is a life lived avoiding God. I have learned that a grateful heart changes your countenance and your outlook…from facing inward to facing outward and upward. Thanksgiving becomes you. So You Want to Give World Peace to Your Mother for Mother’s Day?